The Java Messaging Service (JMS) is a Java Message Oriented Middleware (MOM) API for sending messages between two or more clients. 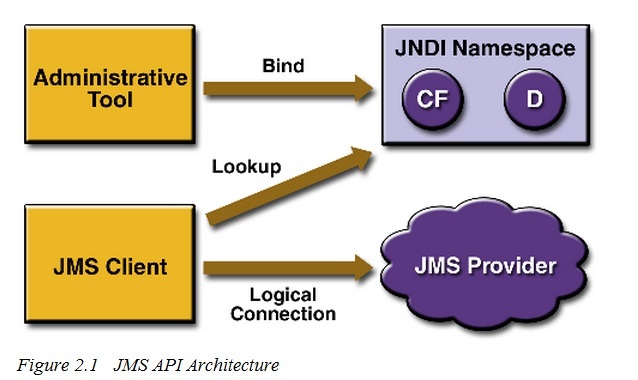 To use JMS, we should have a JMS provider that can manage the sessions and queues. 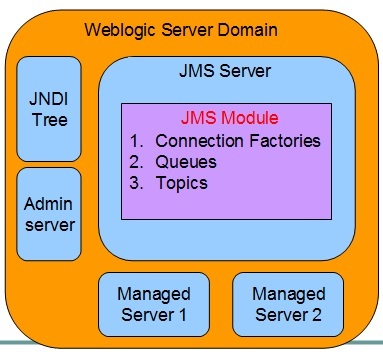 In OSB, weblogic server is the JMS provider. JMS Queue - A space where the messages will be saved for sending or receiving. It will be either saved in the Filestore or JDBC store. JMS Topic - A mechanism for delivering messages to multiple subscribers. JMS Point-to-Point model - Here the sender posts messages to the receiver queue. JMS Publish/Subscribe Model - Here the message will be posted to multiple subscribers. We use 'topic' rather that 'queue' here. JMS Server – To host different set of modules and any associated persistent storage that reside on a weblogic server instance. 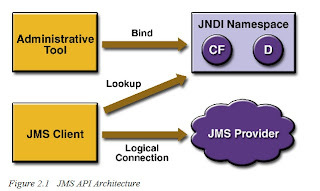 lJNDI (Java Naming and Directory Interface) – resource lookup of JMS resources like connection factories and destinations (queues or topics) which are configured with a JNDI name. lWeblogic persistent storage – To store persistent message data. Eg : Filestore or JDBC-accessible.